SCANNER ONLY, 1D Laser, Extended Range. Cables and accessories must be purchased separately. See accessories. RS-232 Serial Kit, 1D Laser, Fuzzy Logic. Includes Scanner, 20' coiled RS-232 Cable, Power supply and Quick Reference Guide. RS-232 Serial Kit, 1D Laser, Fuzzy Logic. Includes Scanner, 9' coiled RS-232 Cable, Power supply and Quick Reference Guide. PS/2 Kit, 1D Laser, Fuzzy Logic. Includes Scanner, 9' coiled PS/2 Cable, Power supply and Quick Reference Guide. SCANNER ONLY, 1D Laser, Fuzzy logic. Cables and accessories must be purchased separately. This part is custom configured for CL2/Intel, please call for details. 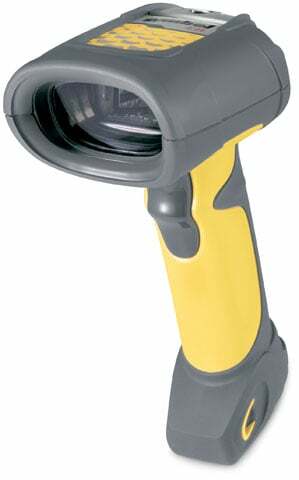 Symbol scanners are great hand held scanners. They are durable and fit comfortably in your hand. We are using the scanner connected to a Surface Pro 3, using an USB connector, mounted on a forklift. The scanner we are using is the Symbol LS3408 Extended Range scanner so the driver can scan a barcode label at a pickup point while sitting on a fork lift. We use several of these scanners, easy to set up, extremely reliable and fast. We use this scanner for tracking our inventory from the moment it arrives to the moment it leaves. It's fast and reliable. Never had a problem with it. We have many of these in our company used in our shipping department. Works great, it can take a beating and will continue to work well. Highly recommend. These ride on our fork lifts to put away product and scan bin barcodes hanging from our ceiling in our warehouse. I use this to scan tiny serial numbers. The reliability saves tons of time and reduces the cause for keying errors. We use many of these in our distribution center across our dry and freezer sections. Very rugged and reliable. By "Call Steve, he can fix anything"
On top of the rugged exterior and ease of installation, the fuzzy logic feature works really well for reading barcodes labels that was once unreadable. We can just replace the label without having to spend a lot of time researching what the label was supposed to be. An added plus is the excellent customer support I received from Barcodes, Inc. For this reason, I am a returning customer and will be again.